If it seems like we’re “hitting hard” on Calvary Chapels and Pastor Greg Laurie, I can assure readers that we’re not out to attack anyone. But Laurie’s actions as of late have crossed over from mildly concerning to five-alarm status. Especially for the Calvary Chapel pastors who are sitting on the fence over whether to disengage from the Calvary Chapel movement (like this pastor in Appleton Wisconsin did). But even if you are not of the CC persuasion, you’re going to want to take some time and read this heartbreaking report by Roger Oakland, who shares the onward march of the visible Church toward Rome. This report by Roger Oakland hits close to home for me personally, as I live near the Marian apparition shrine, promoted by our local mayor of Green Bay, WI (who also heavily campaigned for Pope Francis to come to our area), and I know the leaders involved with the ecumenical Lifest event, at which Catholic Mass mingles with Evangelical worship amidst heavy metal and pop 40 concerts. Also please see our White Paper on Roman Catholicism. 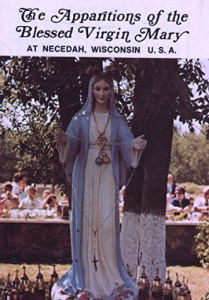 On Dec. 8, 2010, Bishop Ricken formally approved the apparition of Our Lady of Good Help to Brise, making the Marian apparitions that occurred some 18 miles northeast of Green Bay the first in the United States to receive approval of a diocesan bishop. His decree came nearly two years after he opened a formal investigation into the apparitions. [Bishop] Ricken led 9 a.m. Mass from the Thrivent Café Stage on the final day of the 13th annual Lifest celebration at Sunnyview Expo Center. Hundreds worshipped as intermittent showers trickled down on the large tent. . . .
Protestant devotions, a children’s service and the Catholic Mass each were held separately before joint worship at 11 a.m. on the grandstand featuring Lenz; Greg Laurie, senior pastor of Harvest Christian Fellowship in Riverside, Calif., and head of the international Harvest Crusades. It was the name Bishop Ricken that caught my attention when I read the article about the Roman Catholic churches plan to use appearances of “Mary” to enhance the New Evangelization plan. I had heard of Ricken before from other articles I had read. Bishop Ricken shared the platform with Greg Laurie in Wisconsin at a city wide Lifest evangelistic crusade in the spring of 2011 in Oshkosh, Wisconsin. . . . Since Greg Laurie shared the platform in Oskosh, Wisconsin at the Lifest Celebration with Bishop Ricken much more has happened. Ricken has now been promoted to be a key player in the pope’s New Evangelization program. It is well known that Jesuits are behind the devotion to “Our Lady of Peace,” also called the “Queen of Heaven,” that leads to the promotion of the Eucharistic Jesus. This will be an important part of developing a One-World Religion for Peace that will usher in the Antichrist. Therefore, the questions that should be asked are these: Why would Greg Laurie endorse Roman Catholic Jesuit Bishop Ricken by sharing the platform with him at the Lifest gathering in Oshkosh? Is Laurie aware of the damage he has done by forming this association, or is this just part of a much larger game plan that has not yet been revealed? Nearly 500 years after Martin Luther nailed his 95 theses to the Castle Church door, the largest Lutheran denomination in the U.S. has approved a declaration recognizing “there are no longer church-dividing issues” on many points with the Roman Catholic Church. Lest you are unaware of what Christian leaders have been up to the last few years, many of them have openly endorsed the Roman Catholic Church and through their actions or words said that the Catholic Church is not in any serious conflict with Christianity. We wonder what martyrs like John Hus would say if they knew this was taking place among professing Christians. Hus was burned at the stake for refusing to accept Catholic doctrines such as the Eucharistic mass. Was John Hus wrong? If you are not familiar with what Roman Catholicism and Marian apparitions, please do your homework and find out. A final thought. A few years ago, Anglican Tony Palmer (who was working with the Pope to bring back the “lost brethren” to the “Mother church”) spoke at Kenneth Copeland’s church (see video below) and told the crowd that the reformation was over. In other words, the work that the reformers did to break away from the Roman Catholic Church was no longer needed. If that is truly the case, then those who have suffered in the past for standing for truth did so in vain.